Autumn is upon us, and the most colorful season brings more than just crisp air, cozy sweaters, and pumpkin spices into the honeymoon conversation. This shoulder season can bring new experiences and more affordable rates in some of the most popular travel destinations, while also invigorating others that completely thrive in the seasonal setting - foggy mornings, fallen leaves, bonfires, and beyond. 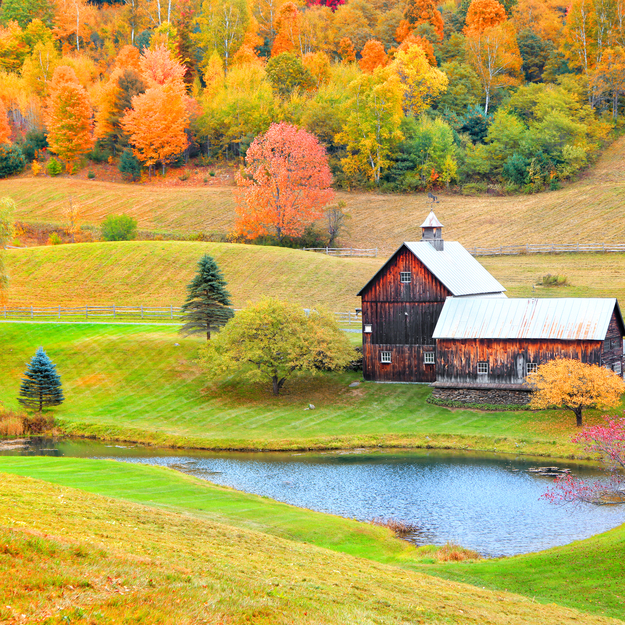 This New England town has been named America's prettiest small town for good reasons - its covered bridges, charming downtown, and picket-fenced streets practically beg to be strolled hand-in-hand with a warm beverage. In autumn, fall foliage is on full display, which further highlights the picture-perfect authenticity of this timeless American town. In a slow-paced single day, you can indulge in local cheeses and maple syrup on a 500-acre family farm, browse boutiques to your heart's content (be sure to load up on flannel), hike through the natural surroundings, and sample Vermont beer before indulging in a romantic farm-to-table dinner beside a waterfall. This Victorian bed and breakfast oozes old-world charm and is perfectly placed within walking distance to the heart of Woodstock's downtown. A three-course custom breakfast is included with every reservation, as is complimentary afternoon wine. Specialty packages include everything from in-room massages, Swiss chocolate truffles, and even a preferred table at the award-winning Simon Pearce Restaurant - one of America's most romantic dining rooms. We've been crushing on pint-sized Portugal as a top honeymoon destination for quite a while. 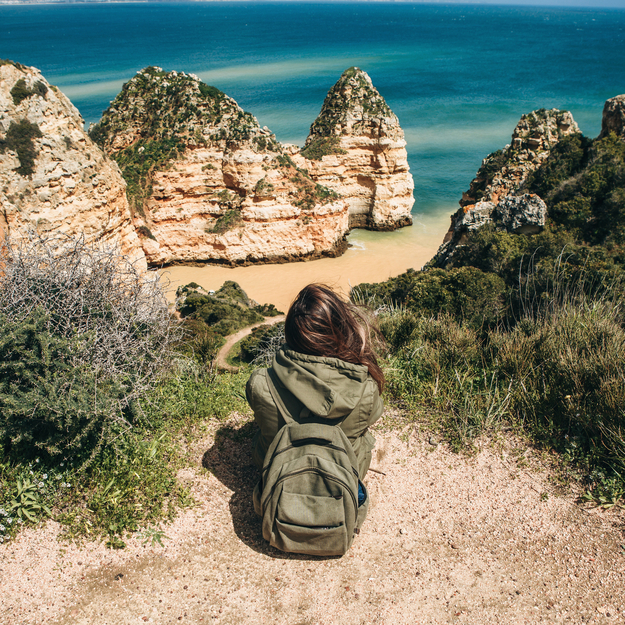 Sun-soaked days, sandy shores, and a bustling nightlife still make Portugal a summer paradise, but we've reserved a special appreciation for the southern Algarve region during autumn. Aside from fewer crowds and more affordable prices, shoulder season days in the Algarve are still kissed with sunshine and graced with agreeable temperatures. While golden leaves and hot cider may be absent from the picture, the ocean is plenty warm enough to swim in, wild flowers and migrating birds will inhabit the formerly barren countryside, and cooler afternoon temperatures make coastal hikes and urban explorations all the more pleasant. Part of the prestigious Pousadas de Portugal luxury chain of hotels which occupy historic buildings throughout the country, this magnificent old palace is loaded with intricate details. Centrally located just outside the city of Faro, it makes a perfect base for exploring the contrasting east and west ends of the Algarve. Bearing a Small Luxury Hotel seal inspires confidence that every moment at the accommodation is well spent - whether strolling through the gardens, swimming in either of its pools (indoor and outdoor) or dining at its on-site restaurant. Though these two neighboring counties make up most of California wine country, they are actually quite different from one another. Napa is America's premier wine-growing region, where over 400 wineries produce world-class Cabernet, Chardonnay, and beyond. A plethora of award-winning restaurants (like The French Laundry) and extravagant accommodations (like Calistoga Ranch) have cemented Napa Valley as the more luxurious destination of the two. Sonoma, just thirty minutes away, is a bit more spread out and is recognized for its intimate vineyards (like Kunde, which offers guided hikes and mountaintop tastings), laid-back vibe, and more simple, seasonal cuisine. Both make for a stunning honeymoon getaway, where hot-air balloon rides, relaxing hikes, and scenic cycling routes showcase the beauty of California's land as its colors morph with the change of seasons. 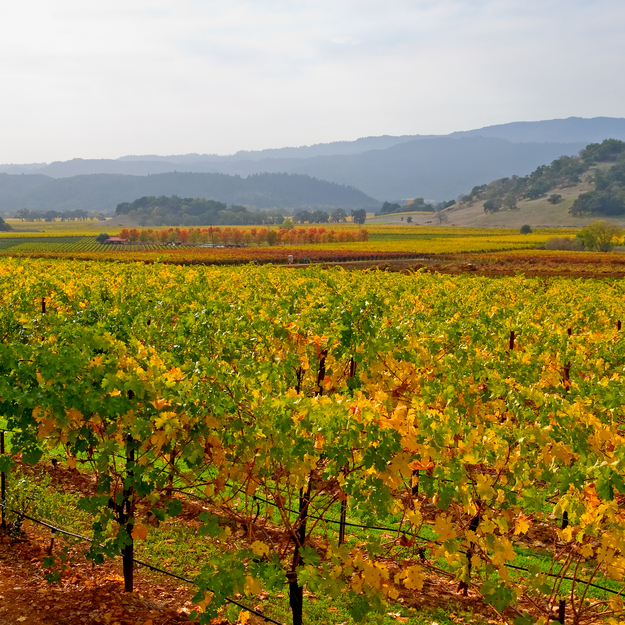 Besides bringing on the fall foliage, autumn also lands in the heart of California's harvest season, where special events like winemaking tutorials and grape-stomping are offered. Conveniently located equidistant from Napa and Sonoma, this resort is loaded with design cues that resemble the surrounding countryside. Repurposed barns, cottages, and silos share the property's sprawling 27 acres with endless grape vines and apple orchards. Modern guest rooms, private gardens, multiple restaurants, and an organic spa ensure that guests are doused in comfort after long excursions across the wine country. 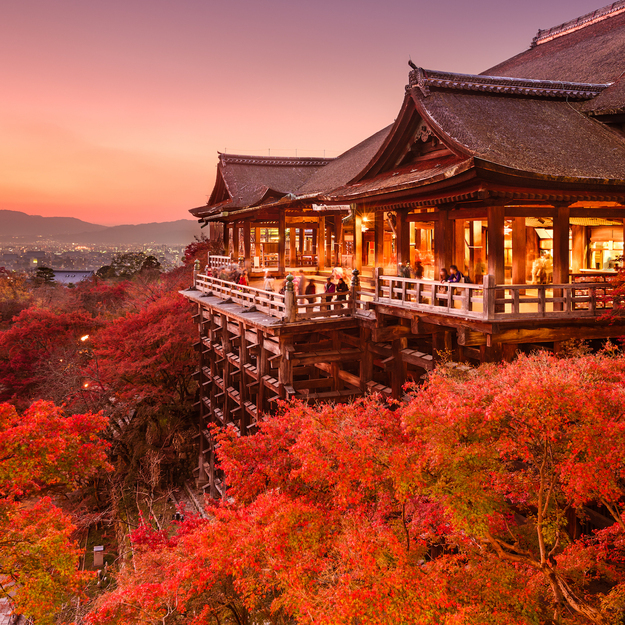 Japan is an inspiring honeymoon destination any time of the year, but during autumn, the city of Kyoto steals the show. The country's ancient capital combines the very best of old and new Japanese culture, from high-quality matcha to ultra-quirky manga and beyond. Come autumn, this mysterious city is highlighted by a kaleidoscope of colors which makes temple hopping, alleyway wandering and riverside cycling all the more atmospheric. Catch glimpses of fleeting geishas as you navigate towards zen gardens, peaceful forests and ancient shrines. Multiple three-star Michelin-ranked restaurants and a highly respected street-food scene promise that Kyoto is also a trip that your taste buds will enjoy. Rediscover the tranquility and simplicity of old Japan by staying in a ryokan. These traditional guesthouses invented the hotel concept, and their original ethos of clean aesthetics - tatami mat floors, sliding doors, and futon mattresses - and warm hospitality - home-cooked meals brought directly to guest's rooms - still honor the accommodation's classic roots. Hiiragiya has been keeping things consistent for over 200 years, on a beautiful side street that is central enough to get out and explore the city. Much can be said about the benefits of visiting any European capital city after the tourist hordes of summer (and the inflating prices that follow them) have departed, but Paris still manages to stand out among them all. 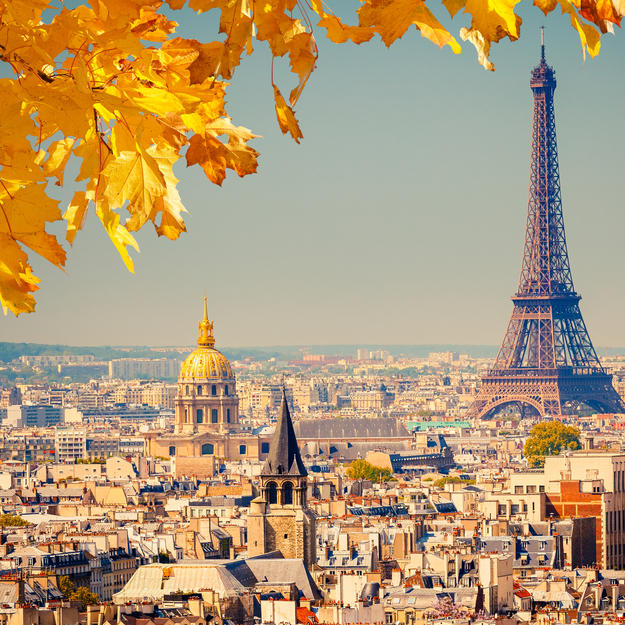 Simple pleasures like observing Parisians during the early morning baguette run or sipping a hot chocolate while warming your hands on a park bench just seem to come alive during autumn. City streets drenched in seasonal colors look like watercolor paintings come to life. Public parks and gardens packed with colorful foliage give a reminding crunch with every step. Renowned museums make for perfect indoor retreats on colder days, and visits to any of the city's historic cemeteries (especially the bone-chilling underground Catacombs) will certainly play in line with the season's spookier side. Need we even mention the pleasures of playing style spy and observing Parisians as they so effortlessly embrace the layers of fall fashion? Autumn also flaunts a riot of colors in the endlessly impressive palace of Versailles and is the best time of year to enjoy one of France's most prided national products, as nearby wine regions celebrate the grape harvest season with participatory festivals. A refined haven in the heart of Paris, this Small Luxury Hotel nestled in a magnificent 18th-century building is conveniently located a stone's throw from the gardens of the Palais Royal and a short stroll from the Louvre and the Tuileries Garden. Complimentary breakfast served in a striking conservatory is a standout, though we advocate reserving a room with a balcony, where you can enjoy your morning espresso and croissant with Eiffel tower views in the comfort of your bathrobe and blanket.